flat to positive opening is expected with positive bias …value buying may be seen in over sold stocks try to pick those scrips which tends to move up …positive closing at end of day can not be ruled out thode se achche din aane wale hain. 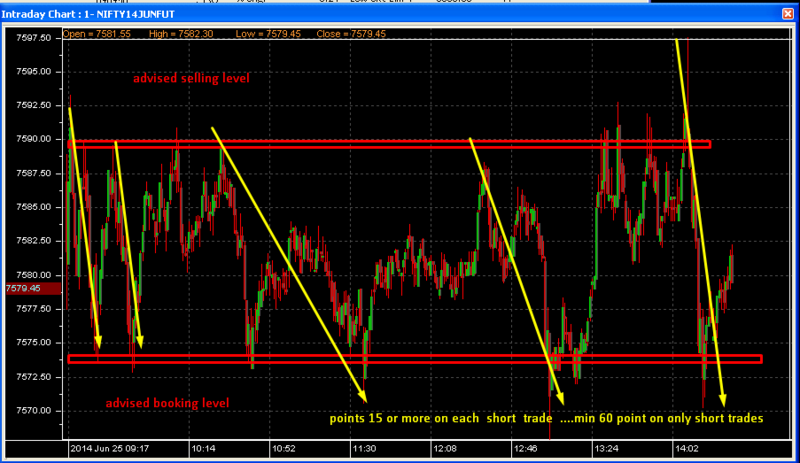 All above levels are targets entry levels and stoplosses depending upon last traded rate and market direction of move. 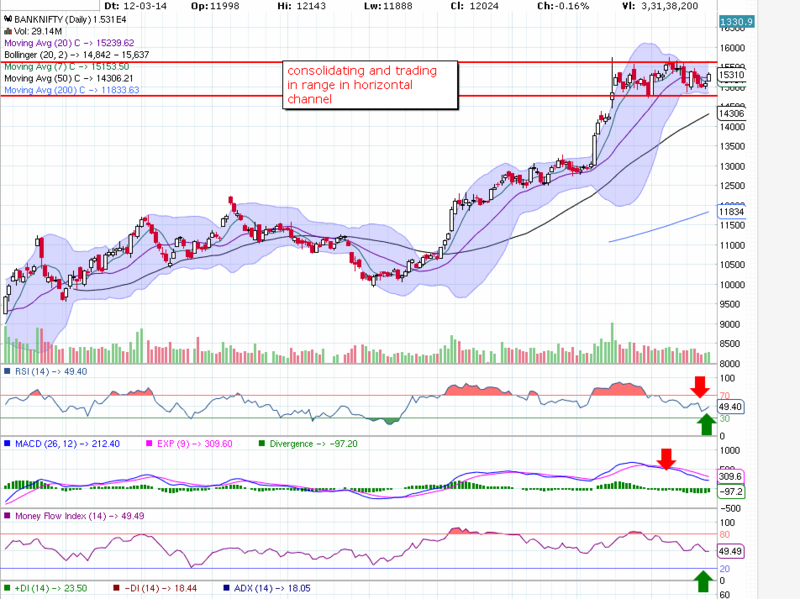 [×] [o] admin: nifty trading above 14 points from days low have u bought at 7521 advised to buy on dips ? 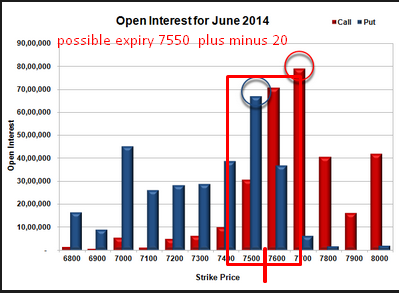 [×] [o] admin: nifty gaining 15 points again from days low 7512 at 7527 …. Friday or fry day …who will be fried today and who will enjoy week end??? we feel bulls are going to celebrate the party ..
eod Nifty chart is showing that closed below 20 DMA and at bottom of channel can we expect value buying at this level ??? expecting red today ..Nifty eod chart showing that nifty is trading above 20 DMA and and in upper bollinger area … maximum indicators are supporting bears so kind of profit booking may be seen at higher levels but value buying in stocks also prevent nifty to fall more may trade in 7520 7580 range and closing in between can not be ruled out . if yes then give a try for 1 week only . Almost flat opening is expected with extremely volatile session ahead …NS is trading at bottom of channel and above 20 DMA with bearish sentiments …as all indicators are in support of bears but 20 DMA and channel bottom are providing good support to bulls …selling with volumes may break these supports and 100 to 200 points correction before expiry cant be ruled out . 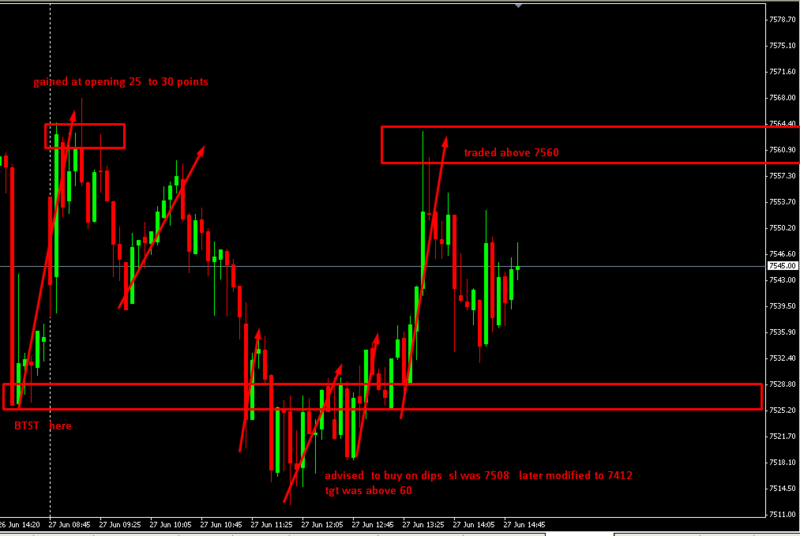 7565 7585 will act as very strong resistance and profit booking at or below this level can not be ruled out …moving above 7585 will create short covering and in that case 7615 30 will be there .plan your trades seeing intra move ,direction and momentum . Do not enter in trade if you are not confident on the trade …if entered in trade be firm and decide that you will either book loss at stop loss level or exit at gains …but never square off ur position between entry level and stoploss till you are not receiving reverse trade call . bank nifty trading at lower bollinger/ channel bottom making inverted hammer.. either selling will continue or buying may be seen trade can be planned after seeing intra move . always keep open buy order below 100 points of LTP and sell order above 100 NF points from cmp if u are lucky u may get both orders executed within a fraction of second. Learn how to end your trading session at positive note …join Dhanvarsha trading and technical analysis online course and make money every day..
contact admin at +919451659275,+919838772020 or mail at kailash123p@yahoo.co.in and start positive trades . [×] [o] Venkat: Just got 2000$ in comex market only in Crude, Gold. [×] [o] deepti: as expected GOLD 26800 traded !! ….movement came at last ……. 16 Jun 14, 08:54 PM deepti: DULL movement ……….. stuck in range ….expect movement at near to closing . These levels may change during market hours depending on price volume action and intra day pivots .